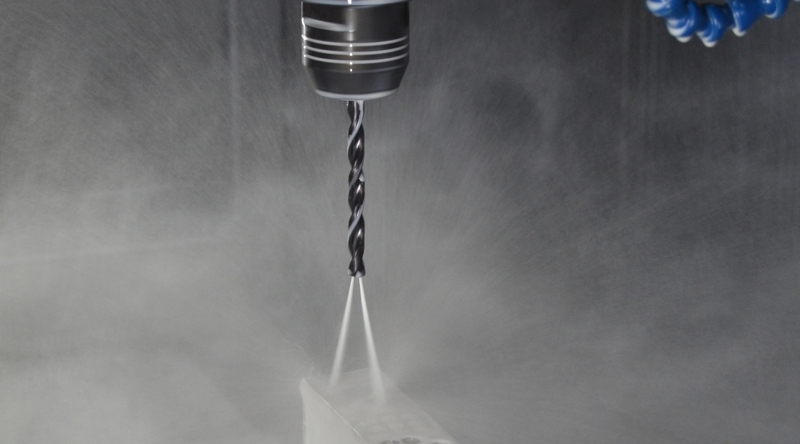 Suitable for machining a variety of materials including steel, stainless steel, cast iron, copper and aluminium, the R459 has been specifically developed to overcome problems typically associated with deep-hole drilling, Dormer says. A key feature of the drill is said to be its Continuously Thinned Web (CTW) geometry which increases both flute volume and cross sectional strength. According to the supplier, the combination of these elements ensures consistent forces throughout the drilling cycle, with little or no increase in power requirement as the drill penetrates deeper into the hole. This, in turn, is said to allow increased cutting speeds and greater performance reliability without compromising tool life. A special outer corner design provides added protection against wear and chipping, especially when under extreme conditions, such as cross drilling applications, while a specially designed 140º point angle makes for easier centring and reduces thrust requirements, Dormer adds. The R459 is available in diameters from 3 mm – 16 mm,, including 0.1 mm increments up to 10.0 mm, and features a titanium aluminium nitride (TiAlN) coating.